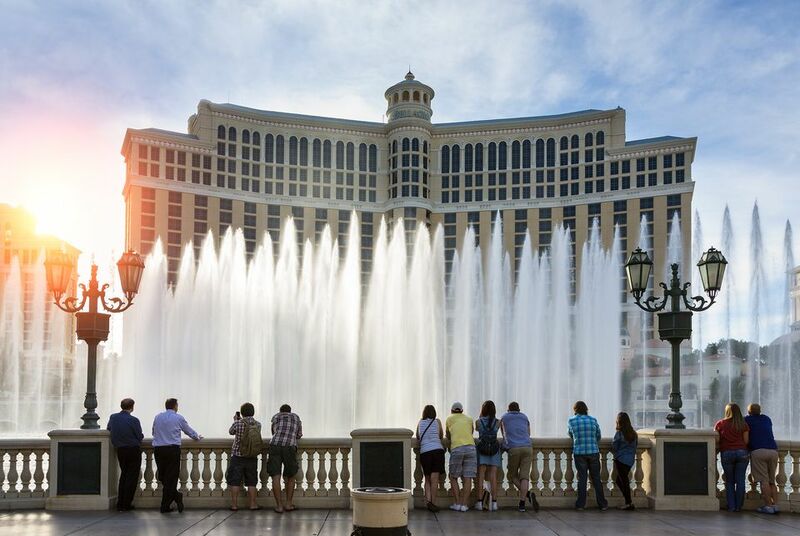 The truth is, it's always the right time to visit Las Vegas, but the average temperatures in some months make the weather a dose of perfection. Las Vegas's climate is mostly dry and arid, with scorching summers and sometimes cool winters. The city receives very little precipitation and winter weather is almost entirely unheard of. If you’re looking to spend the least amount of money on a Las Vegas hotel then you should consider the summer months. With the blistering heat, hotels usually give away rooms (not really, but chances are you can find a better deal). Compare prices on Las Vegas Hotels during different times of the year and you'll see how the weather affects the price. Remember that average temperatures and weather forecasts for Las Vegas don't take into consideration the fact that if you love to gamble you might not ever see the outside of your hotel room. It might not matter to you that there is an extreme heat wave, high winds, or rainfall in the forecast. Read on for a season-by-season breakdown of Vegas weather. During June, July, and August you can sit out by the pool as long as you can handle it. Actually, the trick is to alternate between the shallow end of the pool and your lounge chair. With average temperatures regularly topping 100 F (37 C) in the summer months, you should not allow the Las Vegas weather to dictate your vacation but take advantage of the situation. Add a couple of cocktails and a club sandwich and you can truly relax. Despite the heat, the summer months bring in higher average temperatures they are prime for relaxing by the pool and strolling the strip at night. Evenings bring in the dry summer heat at around the mid-80s F (26 F) to low-90s (32 F). Warm weather should be your opportunity to get better deals and a good spot by the pool. What to Pack: You might be surprised to discover that you need to pack your warmest clothes during summer in Las Vegas. While temperatures outside might be scorching, the air conditioning will be on full blast. If you're planning on spending much of your time indoors at the tables or seeing shows, pack a light sweater or shawl. During the winter, Las Vegas weather tends to bring temperatures that may drop into the 30s F (-1 C) at night but manage to hover around the upper-50s (10 C) to low 60s (15 C) during the day. If you’re trying to avoid the winter shoveling of snow, Las Vegas rarely gets any of it. Real winter weather is nonexistent in Las Vegas, it might get cold but it does not get the freezing temperatures that you might experience. Additionally, climate control is a science in this desert town: You will rarely be uncomfortable while inside. What to Pack: Las Vegas can get chilly during the winter months, so if you'll be spending time outdoors during this season, pack layers, including a lightweight jacket or fleece pullover. While spring and fall do not really occur in Las Vegas the best times to visit often are during those traditional spring and fall months. If you are looking for the best weather in Las Vegas this time of the year is as good as it gets. Any way you look at the situation it’s always better being on vacation and the heat in the summer will not be as bad as you might think and the winter months are not as cold as plenty of spots in the country. What to Pack: Temperatures in spring and fall are pleasant. Pack comfortable, lightweight clothing including a few layers for cooler nights or overactive air-conditioning. If you are a hockey fan you'll find that the best time to head into town to watch the Las Vegas Golden Knights will be anytime between October and April and hopefully deep into June (Playoff Hockey!). NFL football is also finding a home in Las Vegas so that will be roughly from September to January. These months traditionally get the season going for convention visitors so you might battle with hotel room rates a bit.